Queen Elizabeth II (Elizabeth Alexandra Mary) was born on 21 April, 1926 at 17 Bruton Street, London. Her birthday is officially celebrated in Britain on the second Saturday of June each year. The day is referred to as “the Trooping of the Colour”, the official name is “the Queen’s Birthday Parade”. Queen Elizabeth II is a 'constitutional monarch'*. This means that although she is officially the head of the state, the country is actually run by the government, led by the Prime Minister. *The English Bill of Rights Act of 1689 curtailed the power of the sovereign and confirmed Parliaments place at the heart of the English constitution. From this date English Monarchs (now British Monarchs) would rule in partnership with Parliament. The Queen lives at Buckingham Palace in London. There has not been a Queen of England since 1707. Queen Ann was the last ever King or Queen of England. From 1707, the monarch, although living in England, has been known as either the Monarch of the Kingdom of Great Britain (as Queen Anne was) or of the United Kingdom (as Queen Victoria was). 'Elizabeth the Second, by the Grace of God of the United Kingdom of Great Britain and Northern Ireland'. When did Queen Elizabeth come to the throne? Queen Elizabeth II ascended the throne on February 6, 1952 upon the death of her father, King George VI. Her Coronation, at Westminster Abbey, followed on June 2, 1953. 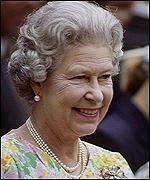 The queen celebrated her Golden jubilee (50 years since her accession) in 2002. Queen Elizabeth II is the United Kingdom's Head of State. She is queen of 16 former British colonies, including Australia, Canada and New Zealand; and head of the Commonwealth, a multinational body created after the dissolution of the British empire. The Queen as married to the HRH Prince Philip, Duke of Edinburgh, the son of Prince and Princess Andrew of Greece and Denmark. They married on 20 November 1947. The Duke is Queen Elizabeth's third cousin; they share Queen Victoria as a great-great-grandmother. Why is Queen Elizabeth II's husband a prince rather than a king? In the British monarchy, the husband of a female monarch does not have any recognized special status, rank, or privileges. Prince Philip was a prince from birth. He is the son of Prince Andrew of Greece and was born Prince of Greece and Denmark. Upon his marriage to then-Princess Elizabeth in 1947, Philip was given the title "Duke of Edinburgh, Earl of Merion, and Baron Greenwich," and was made a Knight of the Garter. (He became a British citizen around this time and renounced his Greek and Danish titles). Elizabeth II was coronated in 1953, and in 1957, she granted Philip the title "Prince of the United Kingdom." What is Queen Elizabeth's surname? The Queen does not normally use a surname (she doesn't need a passport or a driving licence for example), but on the few occasions where it has been necessary, i.e. when serving with the ATS during World War II, she has used the surname 'Windsor'. The British royal family changed their last name from Saxe-Coburg-Gotha to Windsor in 1917. Why? World War One broke out in 1914 and anti-German sentiment was its height in 1917. In protest, King George V renounced all the German titles belonging to him and his family and adopted the name of his castle, Windsor. From 8 February 1960, all The Queen's descendants who do not bear the "style, title or attribute of HRH, and the titular dignity of Prince or Princess" have the name of Mountbatten-Windsor. (Mountbatten as Prince Philip's surname). Among the official royal residences are Buckingham Palace, Windsor Castle, St. James Palace, Balmoral Castle, Frogmore House, The Palace of Holyroodhouse, Sandringham House and Kensington Palace.